What if you could harness that data and show your executive team reports that tell an accurate, robust, insightful story proving that your campaigns value. Not only in feel-good ways like brand awareness but also in real revenue terms. This is the opportunity for marketing teams. Reports show that marketing teams see as little as 3% of all collected data. 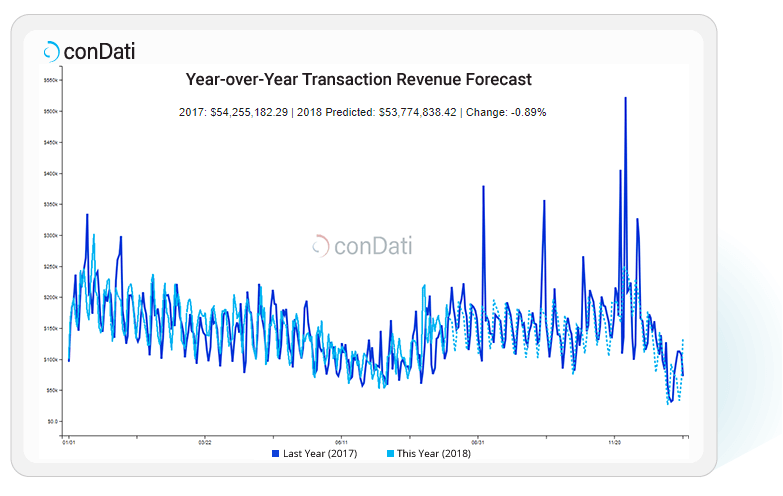 One of conDati’s alpha clients reported that their marketing team regularly saw only a maximum of 10% of the data collected from all channels (i.e. all Google Analytic accounts, Facebook, Salesforce Sales Cloud CRM, Marketing Cloud for email and marketing automation, Fonteva for event management, and Form Assembly for lead capture) before switching to conDati. What was your combined Google Ads and Facebook Ads cost over the last quarter? What is the relationship between paid search and transactions? How did your email campaigns do yesterday? 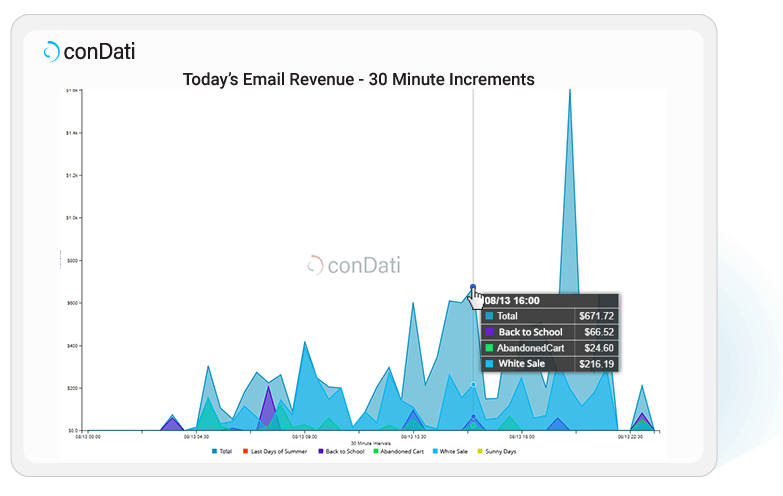 More specifically, how much revenue did each campaign bring in, in 30 minute intervals? How many cumulative video views were there from March 15, 2018 to today? What percentage of your target is that? 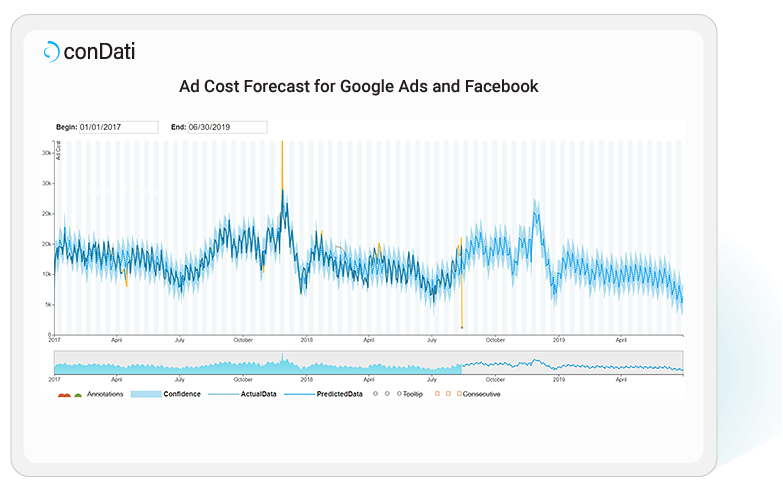 What is the forecast for your ad cost for the next quarter? How will your email campaigns do next winter? How many transactions will you have this fall? If you were not able to find those figures with a couple swipes on the screen of your choice, you’re losing valuable insight into your marketing campaigns that should be at your fingertips. Not too long ago, the marketing department was considered a “tolerated expense” — in the best cases, everyone believed that marketing added value, and possibly even revenue to the company. But hard and fast numbers to back that up? There were none. Fast-forward and the promise of digital includes the opportunity to prove that the investment in marketing campaigns brings not only soft values to the company, but also revenue. It should be possible to prove with a quick swipe that the money invested in email campaigns last spring is paying off — and in specific, well-documented ways.